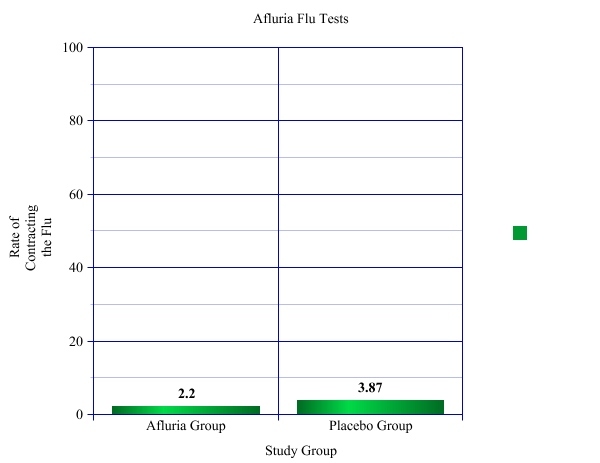 The flu vaccine is super-duper effective… I guess. When everybody talks about how effective the flu vaccine is, it’s so interesting because people just assume that they will automatically get the flu without the vaccine. I know I’ve fallen victim to this idea for no good reason except media hype, though I’ve never gotten a flu vaccine. But check this out. When you actually look at the numbers, a person’s chances of getting the influenza in one flu season aren’t even that great anyway if Merck’s study truly represents flu contraction statistically. I mean, I know I’m not a doctor,but that’s not too terribly impressive to me. I guess you have to decide for yourself. 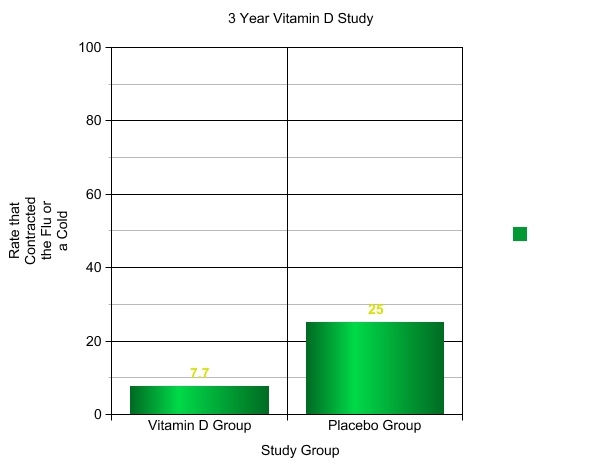 On the other hand, check out what the graphs look like when you compare vitamin D supplementation to a placebo group. This particular study references African Americans, so keep that in mind as without supplementation, African Americans are more likely to be deficient in vitamin D. This study is reported incidences of cold and flu, because no lab tests were offered as this study’s original intent was simply to monitor bone density. Cold and flu were just extra information gathered to consider adverse reactions. This test period also lasted over the course of 3 years. So while it’s a much smaller test group, it’s especially cool because it lasted a long time and it wasn’t about the flu, so there’s less chance of influence factoring in. It should also be noted that once the level of vitamin D supplementation went up to 2000IU from 800IU halfway through the study, the reported incidence of cold or flu was less than 1%. So, while I can’t say that taking vitamin D can be used as a preventative for the flu in place of the vaccine, because the FDA frowns on that kind of thing, I’m considering complaining to the FDA that my bottle of vitamin D3 doesn’t have all of its adverse reactions listed on it. That’s highly irresponsible. *In 2006, Dr. Cannell’s article, “Epidemic Influenza and Vitamin D” was published in the journal, Epidemiology and Infection. The article, co-written by some of the world’s top vitamin D experts, presented a revolutionary new theory on vitamin D’s link to the flu. This quote was taken from an interview with Dr. Passwater from WholeFood’s Magazine in 2011. Disclaimer: I’m not a medical doctor, or any doctor, so this is not to be considered medical advice. The FDA has approved no statements encouraging the use of vitamin D to support resistance to influenza in any way. The FDA & CDC recommends almost everyone get an annual flu shot. Photo credits: We made the graphs ourselves. Feel free to use them in your own articles, just give credit to everythingbirth.com. Previous PostDelaying the MMR- Some big issues to consider. How much do you take and what kind of vitamin D do you take? It might suit you to get your blood tested to see if you are deficient. Needs vary tremendously based on how much a person is outside, if they tan, where they live and the color of their skin. For example, I take around 6000IU daily in the winter because of where I live. I make sure to take the D3. Kelly, I’m not “trying,” there are numerous studies that will back this up. Also, vaccinations are often implicated in depressing a person’s immune system. I can’t really get into the nitty gritty of that, but if you are interested in learning more, I can direct you to medical professionals where you can find medical information on that. Tagamet, Pepcid, Zantac, Axi) or some Cholesterol meds ( like Cholestyramine, Colestipol) you will need more vitamin D as well because these deplete your body’s reserves. Likewise, if you eat a diet very low in animal fat, your will deplete Vitamin D.
Some people need over 10000IU each day to be where they need to be. A blood test from a doctor can help you figure this out. You can’t say that you take vitamin D and still feel crappy so this theory is bunk until you’ve checked to see where your are. Of course, other vitamins are also helpful like large amounts of vitamin C from natural sources too. Vitamin D however is the most common way for us to boost our immune system. Let me know if you’d like information on sources and as your doctor to do a blood test. If you’d like me to show you more studies or medical doctor commentary on the subject, I will be happy to do that as well. Oh also…. soda and caffeine will zap the vitamin D right out of you too. You also need to make sure the type of vitamin D you are taking is D3. This is very important. Right, and if I remember right, the type added to lots of “bone blends” and milk is NOT. You can’t look at a study that was designed to look at something to completely different and get a result. This doesn’t control varying factors better, and you certainly can’t apply it to the general population if it only looked at one ethnic group. The best you can say is that something is worth looking into in further research. Also, I’m not sure how much you know about statistics, and I’m certainly no expert, but you can’t compare straight percentages to see whether something is worthwhile (as in, “statistically significant”). And, in the end, the flu can be deadly. Not to the average 35 year old woman, maybe, but to their infants who are too young to get the flu shot and the elderly that they may work around or live with. For this reason, I’ll continue to get a flu shot, to protect my son and my grandparents. I also take Vitamin D, as I am deficient, but people should definitely get tested to find out what dose of D they should be taking – it is not something you should take too much of. It is a fat soluble vitamin and there are side effects. As far as the type of D – D3 is the OTC kind. I don’t think I’ve ever seen another kind in a supplement, but obviously I haven’t seen all the supplements in the world. The prescription Vitamin D product is actually D2. I have read that either D2 or D3 are added to milk. I fully noted the statistical variances in, and even offered additional potential varying factors to it. So, I certainly wasn’t trying to be deceptive. Also, Yes, as I stated, you SHOULD get tested to find out if you are deficient. Though if you are not, 2000IU, will not bring you anywhere near an overdose. Even 10000IU will not. You will have to take a grossly large amount to harm your body. (http://www.ncbi.nlm.nih.gov/pubmed/10232622) There is also information available on that in the last vitamin D post I wrote. The reason why many people choose not to get the flu shot is because it’s a yearly vaccine that adds toxins and depresses your immune system. But my intent was never to convince anyone to do anything, juts offer information so you can do your own research from there. There are vasts amount of information about vitamin D and how it improved your immune function. Vitamin D2, from my understanding is not readily available to our bodies to use, but is most often the one added to milk and the bone strengthening chews and such. Though as people become more educated on it, things are switching over to vitamin D3. If course the very best way to get vitamin d is from the sun, next would be from cod liver oil, and then vitamin d3 caplets.